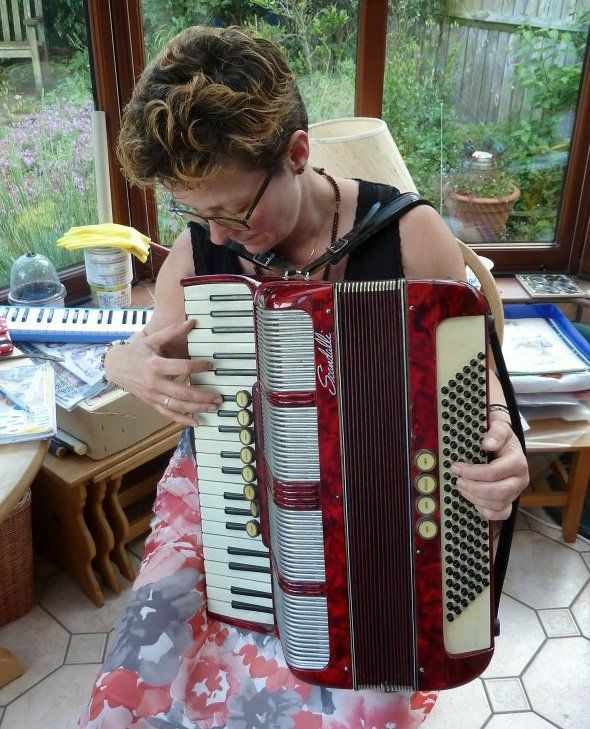 I am helping Karen Tweed with a project to produce an accordion that is lighter and more comfortable to play without compromising the tone quality or ease of playing. This page is to make any ideas available to others involved in the project and should be regarded as a work in progress. To comment or add information to the work so far please use the email address below. September 2017 Other than a lot of thinking and a little CAD work there has been little progress on the actual project. 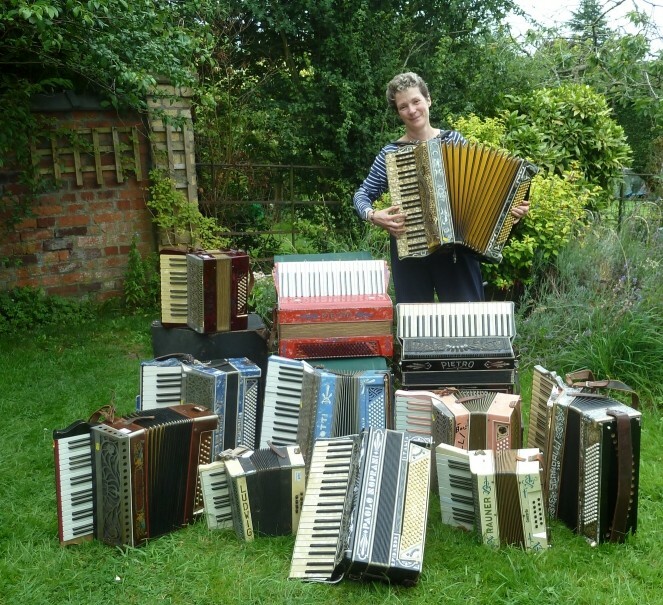 Karen had a collection of 13 accordions from the 1930's and these have been moved into my garage with a view to providing a source of reeds to experiment with. I plan to keep a blog of the work as it progresses. 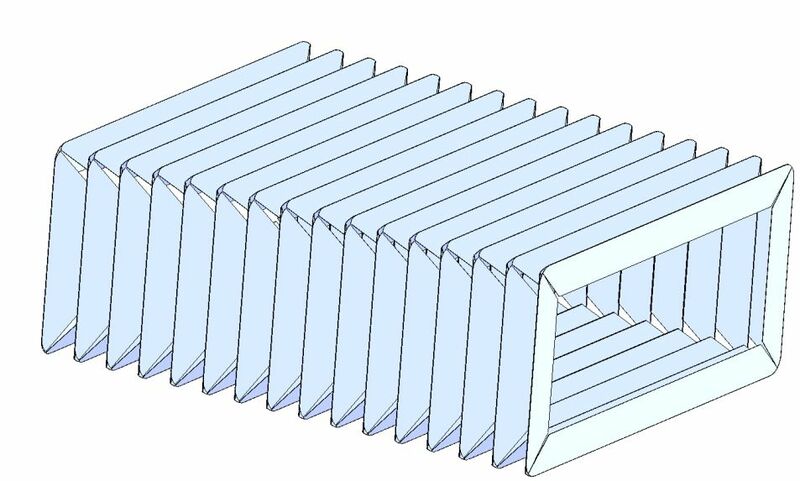 Karen and I will be attending a 2 day accordion repair course at the end of September 2017 and I expect that I will learn a lot that will help in the main project to design a lightweight accordion. 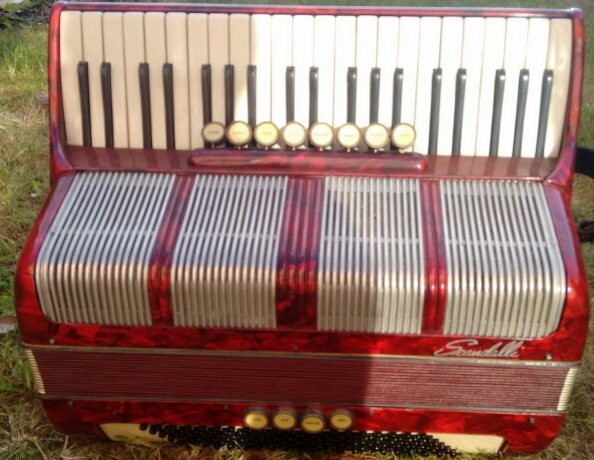 To visit the page about the vintage accordions click on the picture below. The collection of vintage instruments awaiting restoration. 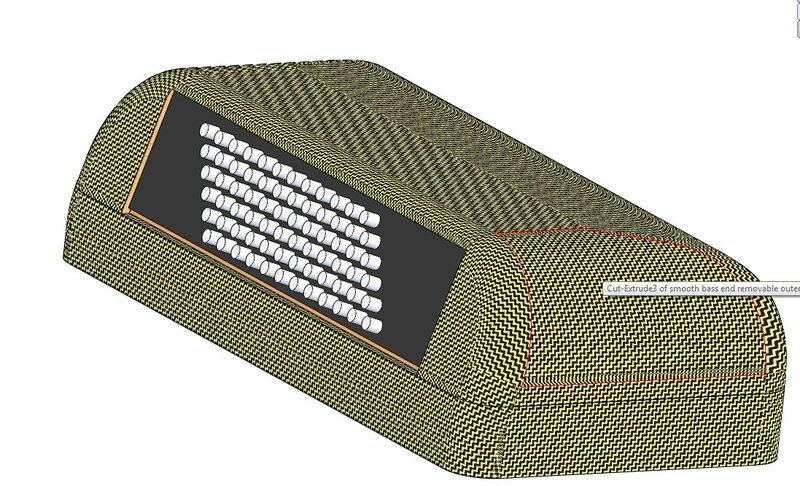 The alternate bellows design is ongoing and I am about 25% through making the parts (mainly the fibreglass flats). Carleen was also involved in the use of carbon fibre for the front of violins. click here to read the article. I am hoping to gather some insights from Jim into the acoustics of the Accordion and to understand what is important to the tone production. I have been looking at the keyboard with a view to making it lighter and to have less inertia - it is the inertia that makes fast playing so tiring. 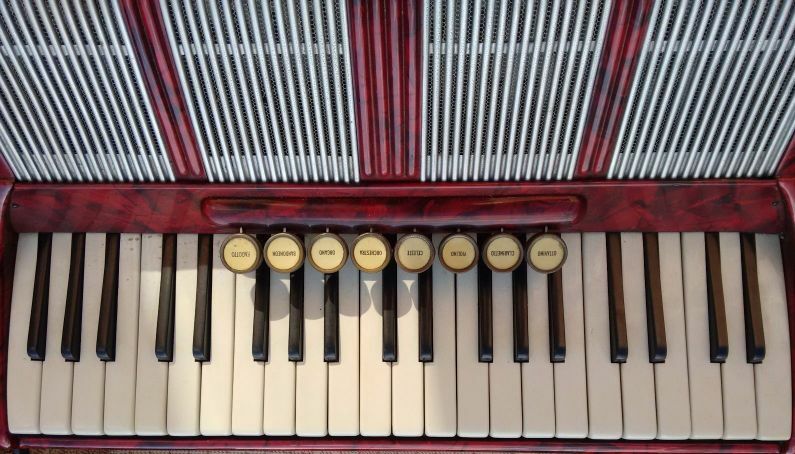 It looks as though it may be possible to re-arrange the valving more like the melodica so that it is closer to the pivot thus reducing the inertia of the keys. This make another change possible. Once the keyboard valving is nolonger in direct contact with the reedblock mounting face it becomes possible to change the position of the keyboard and even make it adjustable. I will need to do a 3D model to see if there are any mechanical problems and there may be acoustic reasons why it won't work but I plan to do some simple prototyping to see. Body lightening - the Body is the heavest part of the instrument and a lot of it seems to be merely a protective covering for the mechanisms. It is mainly thick wood and usually rather crudely constructed. 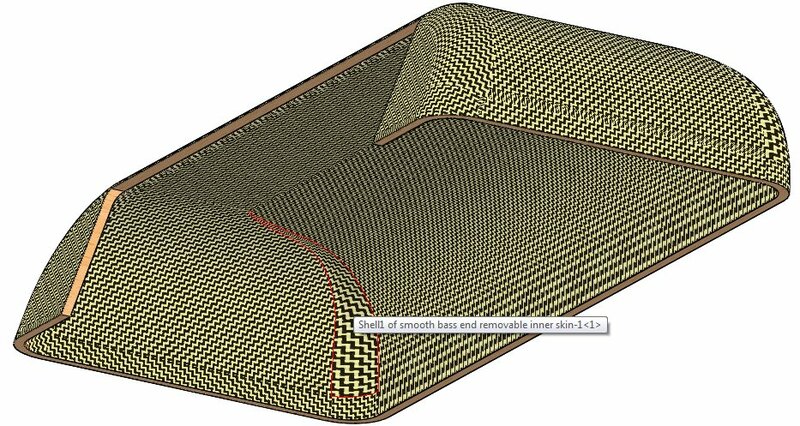 It should be possible to replace a lot of it with composite mouldings giving a significant reduction in weight, easier access to the internals and a more pleasing or ergonomic shaping. Reed blocks - These are around 1/3rd kilo each and it does look as though a lighter design is possible. 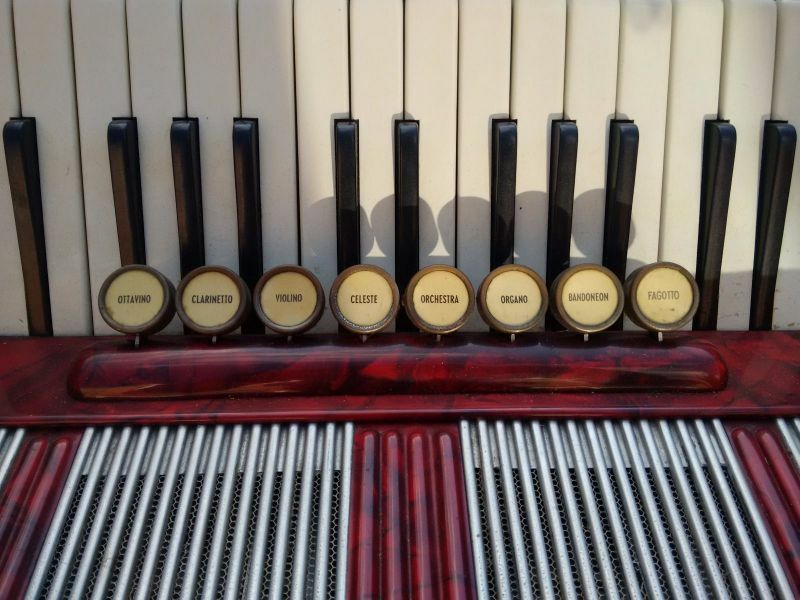 The Scarlatti has 5 and, if it is possible to get the weight down to under 200grams a total saving of nearly a kilo is possible. I have looked at the bass end to see what opportunities to save weight are available and I think that there is the possibility to save a chunk of weight by re-imagining the main elements. From Talking to Karen I believe that the weight of the bass end is a significant contributor to the fatigue experienced after playing for any extended time i.e. in a session. The weight of the bass end has to be supported only by the left arm and, when extended, the effort required is not insignificant. I have modelled 3 alternative end cover designs to compare the weights. 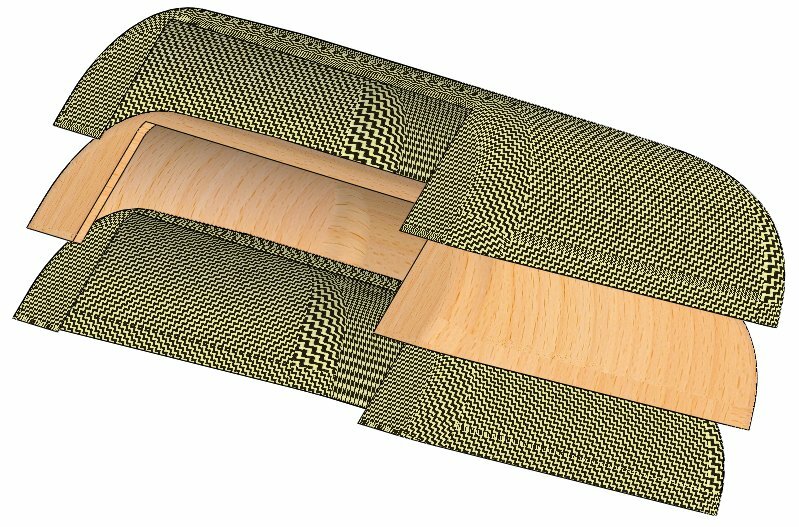 My first pass at CAD modelling an alternative bellows construction looks as though a saving of 1/3rd of the bellows weight is possible. Keyboard The range should be from the F below middle C to the D 2 octives above. Bass end, Assembly A 24 reeds in 2 rows of 12 - one row looks as though it is an octave below the other and they sound simultaneously. Bass end, Assembly B 24 reeds in 2 rows of 12 - it looks as though the 2 rows are in the same octave . One thing I notice is the the reed banks on each side of the assembly 'A' block are connected together. I have Had a first pass at an alternative design that should be both lighter and cheaper to make and assemble and shouldn't compromise the sound. I have modelled up the main woodwork of the original bass end reed block assembly A to get an understanding of how it is put together. It looks rather labour intensive to assembly and quite heavy for what it does. Here is my first pass at an alternative design. This gives a possible weight saving of between 20 and 25%. I can't see any reason why this design shouldn't work as well as the one it replaces and it is simple and cheap to make. I am ordering a set of components and I will fit it with a set of reeds and try it in the Scarlatti. The components are laser cut from ply and this is a very simplified version. 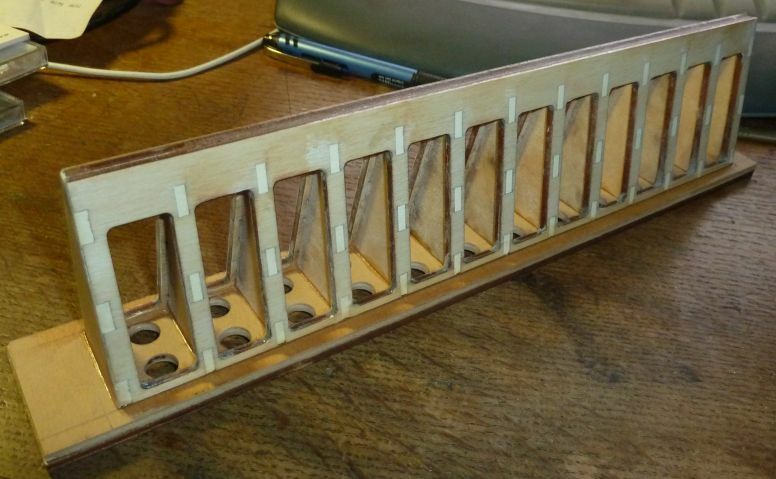 I can see that a varient will also work with the keyboard end reed blocks. I have assembled the prototype parts and it looks OK. Assembly was quite straight forward and would be easy in quantity using an assembly jig. You will notice that the bottom plate is made in 2 parts laminated together and the top one has round holes. The reason for this is that the company doing the laser cutting couldn't cut thicker material (it is to do with the power of the available laser) so I planned to laminate two layers together but due to a mistake on the part of the laser cutting company only one was cut, so, I had to make the extra one and wanted to try the effect of the round holes. The bottom lamination has rectangular holes identical to the original. This is a second hand instrument supplied for the project by Hobgoblin. As supplied it was broadly in working order with the exception of one bass button that has been pushed right into the body. I was able to rescue this and the bass mechanism works now. My Plan for this instrument is to see where I can save weight by redesign. I have started by looking at the bellows which seems quite heavy for what it does. 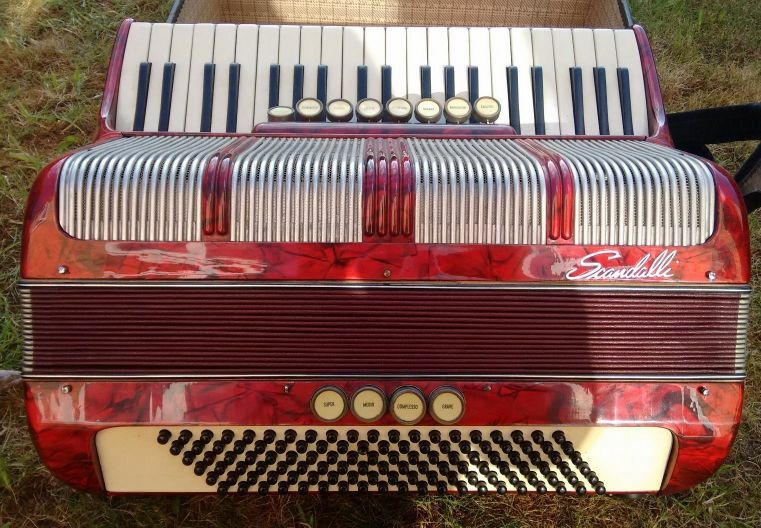 The project has acquired a rather tired Scandalli accordion so that we can take it apart and look at the possibilities. 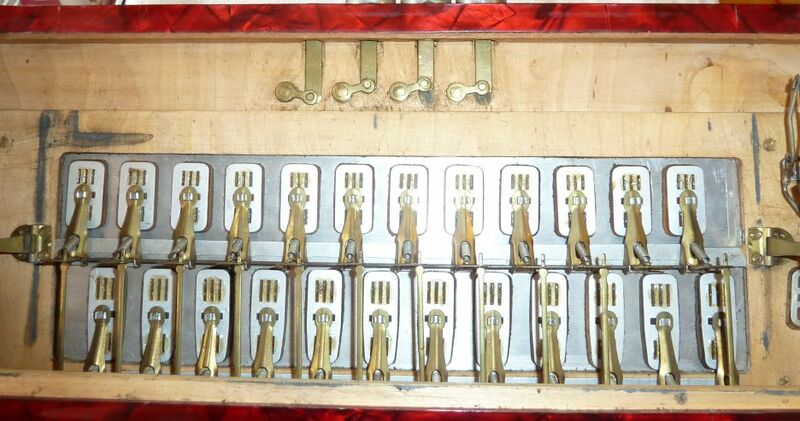 Here are the pictures from Ebay and we will add more as we get into the instrument. I understand that this is a common problem and I have an idea to make it a thing of the past!! The bass end valves. One of the coupling links between the 2 rows of valves is missing (later found inside the instrument). view on the underside of the bass mechanism (after I had repaired it after the ravages of the postal system). 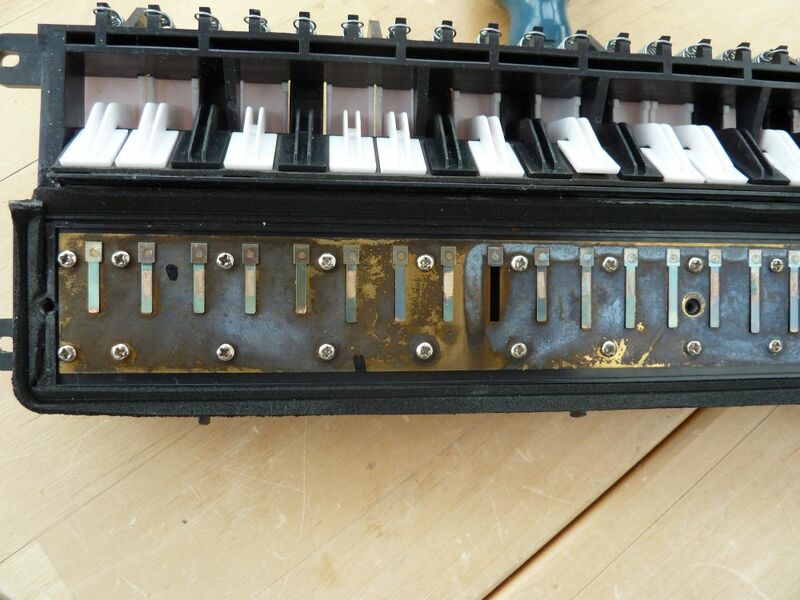 The front of the bass mechanism after repair. Karen playing the Scandalli after I had sorted the bass end and put it back together. There is more to do to refurbish this instrument!! This is a very simple mouth blown instrument with a retail price of £25 and is included here to spark ideas on simple mechanisms. This instrument is a broken one provided by Karen. Click on a picture to view at full size. Picture 1 shows the view on the bottom of the instrument with the cover removed. The reed bank is divided into 2 blocks and there are only 8 different lengths of reed. Picture 2 is a closer view on the reed bank. The note that doesnt play can be clearly seen and the tongue of the reed has broken off probably due to fatigue. Picture 3 is a single key. This is a fairly simple moulding and weighs only 4.6 grams. Picture 5 shows the simple pivot for the keys. This design is extreemly simple and very well thought out. 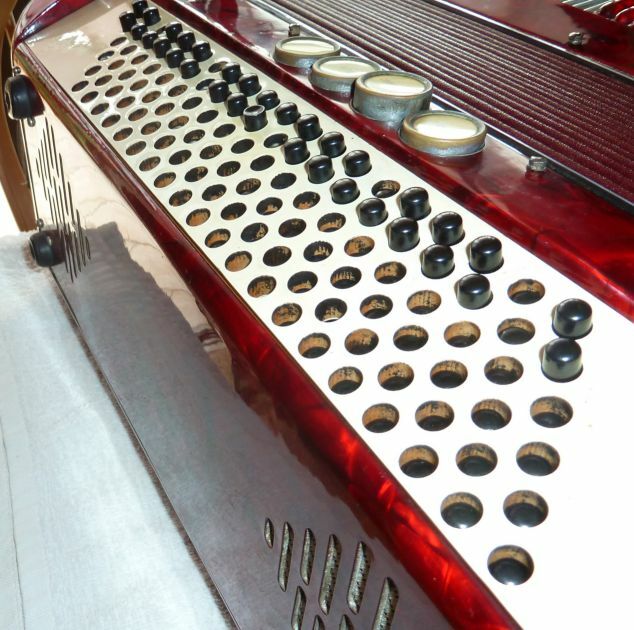 It is presented here as there may be ideas that can be used in the accordion project.